A toaster oven is a great small appliance that should be found in every kitchen. Owning a toaster oven is basically like having another small fully function oven sitting on the counter. Toaster ovens are a handy appliance because they can be used to quickly heat up leftovers with more cooking precision than the microwave, cook an entire dish without heating up the entire house with the oven or cook a side dish when there is no more room left in the conventional oven. In addition to being a handy appliance on the top of the counter, toaster ovens are also a must-have for anyone in college. 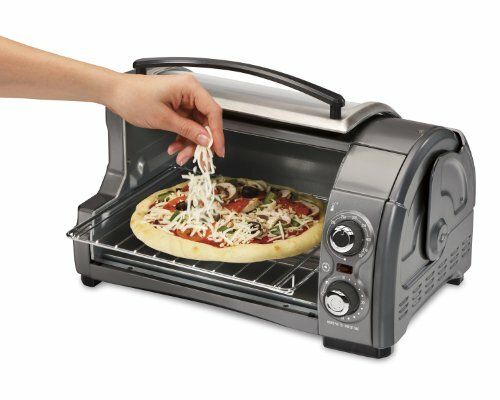 Dorm rooms and small apartments do not have space for a full conventional oven, but a toaster oven can fit almost anywhere. There is no need to miss out on home cooked meals just because there is not a lot of space in the room. 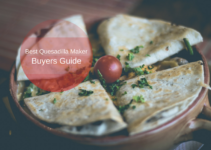 There are hundreds of toaster ovens on the market right now, so here is a breakdown of the ten best toaster ovens money can buy. This toaster oven is large enough to cook an entire casserole dish or a 12-inch pizza, but it will still only take up 13.5 inches on your counter. The large digital display makes it extremely easy to see the temperature and the time remaining on the timer. There are five cooking options that can easily be set with the push of one button. These cooking settings allow you to perfectly cook your pizza, cookies, bagels, potatoes and frozen snacks. The timer can be set for up to 120 minutes, so you will have no problem completely cooking any dish in this toaster oven. The removable crumb tray at the bottom of the oven makes cleaning a breeze too. 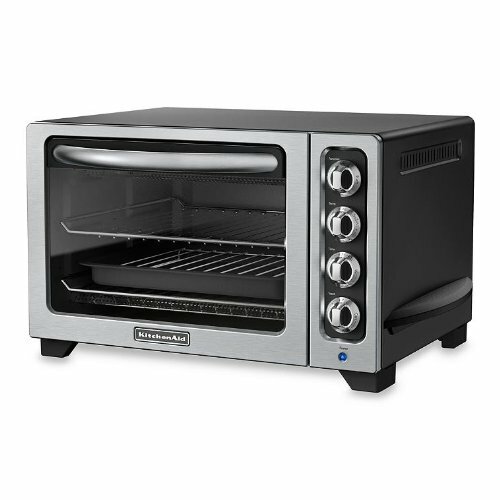 This Hamilton Beach toaster oven features a sliding door that makes accessing the food extremely easy. 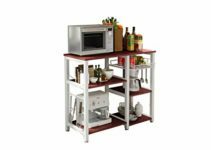 The design of the door and cooking tray also ensures that no food will ever spill on the door, which makes cleaning very easy. There are three different cooking functions on this item to perfectly broil, bake or toast any item you please. The cooking tray is big enough to toast four pieces of bread or cook a nine-inch pizza in a matter of minutes. Since this toaster oven comes in either red or silver, you will have no problem matching the decor of your kitchen. The timer only goes up to 30 minutes, but you can use the stay-on mode to cook longer without resetting the timer. Cooking in a toaster has never been so easy thanks to this Cuisinart toaster oven. The cooking tray automatically retracts from the oven before and after cooking, which eliminates any need to stick your hands in a hot oven. 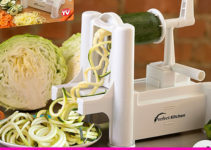 You will have no problem setting the cooking function and temperature with the easy grip dials. The large interior cooking space in this toaster oven allows you to toast six slices of bread, toast four bagels, cook an 11-inch pizza or roast an entire chicken. The stainless steel design provides a classic look that will look great in any kitchen. 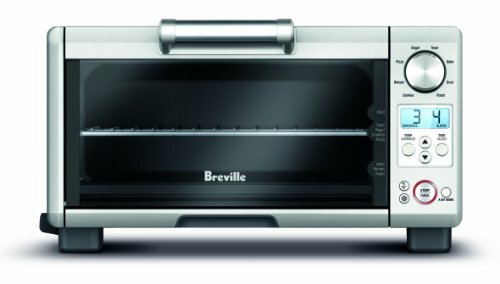 The combination of the three cooking rack positions, eight cooking functions and the four smart adjusting cooking elements guarantee that you can perfectly cook almost anything in this Breville toaster oven. The eight cooking functions are bagel, toast, pizza, bake, broil, roast, cookies and reheat. The non-stick interior makes cleaning simple. Unlike some toaster ovens, you will not be able to stack anything on top of this item because it vents heat through the top of the oven. If your food does not look done when the timer goes off, then can push the “little bit more” button to add some cooking time. 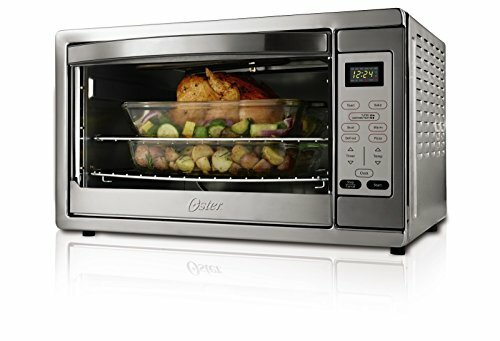 The large cooking area in this Oster toaster oven allows you to cook anything you can fit in a 13″ X 9″ pan. Cooking a roast or another large piece of meat can be done in a few hours without having to heat up the entire house with the conventional oven. The 90 minute timer automatically shuts off the oven when the time ends, so you may need to reset the timer a few times when cooking larger items. 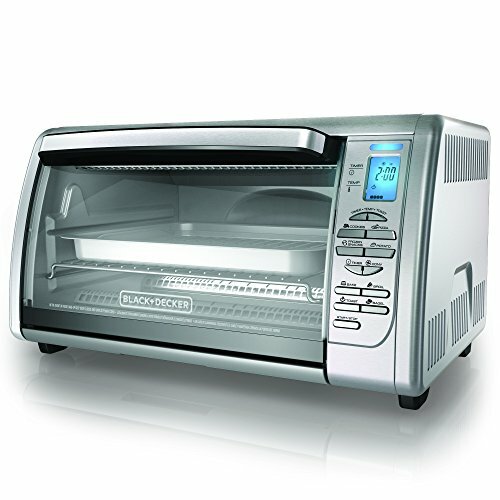 You can even get rid of that ugly old toaster since this oven perfectly toasts up to six pieces of bread in seconds. This large toaster oven may even become your go-to cooking device since it provides cooking versatility that an oven or microwave can’t give you. 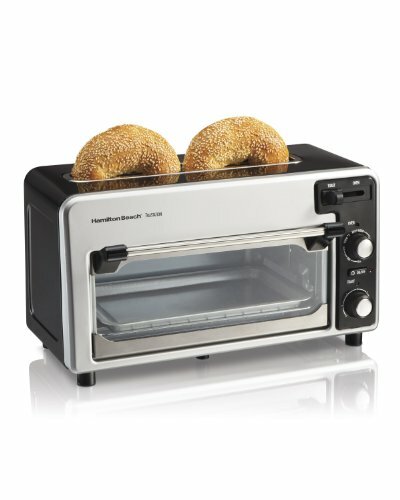 This Hamilton Beach toaster oven functions unlike any other toaster oven on the market today. 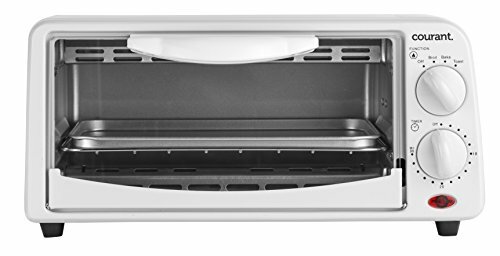 While most toaster ovens require you to put your bread in the oven, this device features a toast slot on the top of the oven just like a traditional toaster. The toast gradually slides down into the oven to cook and pops up when it is done to your specifications. With the slide of a button, you can begin baking an item in the oven seconds after the toast is complete. This unique design allows this product to only take up nine inches of counter space. 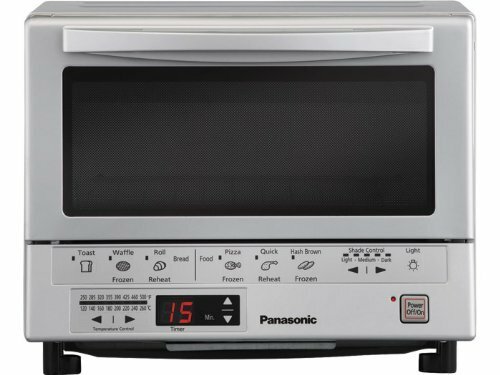 It might look like you have an old computer on your kitchen counter, but this toaster oven from Panasonic will be able to masterfully handle your cooking needs. The Flash Xpress cooking element used in this product has been proven to cook up to 40 percent faster than other toaster ovens. While you can set the temperature and timer, the smart oven can also automatically determine the proper cooking time when you use one of the six cooking functions. The cooking functions found on this product are toast, waffle, roll, pizza, hash brown and quick reheat. It currently comes in either white or silver colors. 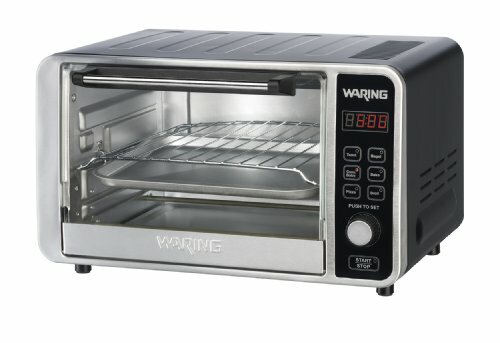 The .6 cubic feet capacity of this Waring Pro toaster oven allows you to easily cook a 12-inch pizza or six slices of bread. Cooking can be done on either the oven rack or baking pan. The removable crumb tray sits at the bottom of the oven to make cleaning a painless process. The LCD display and touch controls make it extremely easy for anyone to use this oven. While the timer only lasts for up to an hour, but it can easily to be reset to extend the cooking time. If you are looking for a simple and compact toaster oven to handle your basic cooking needs, then you can’t go wrong with this product from Courant. The toast, bake and broil functions on this toaster oven eliminate the need to set a cooking temperature. While the timer may only go up to 30 minutes, almost everything you cook in this oven will be fully cooked within this time frame. Only 6.3 inches of counter space will be taken up by this toaster oven, but it can still cook two slices of bread or a nine-inch pizza. This KitchenAid toaster oven features a tall design that allows it to fit two stainless steel cooking racks and a broil pan all at the same time. This means that you will have the ability to evenly cook two 12-inch pizzas at the same time. Use the three cooking functions to perfectly bake a pie, cook a large piece of meat or make four pieces of toast. The onyx black or liquid graphite color options guarantee this toaster oven will look amazing sitting on any counter.